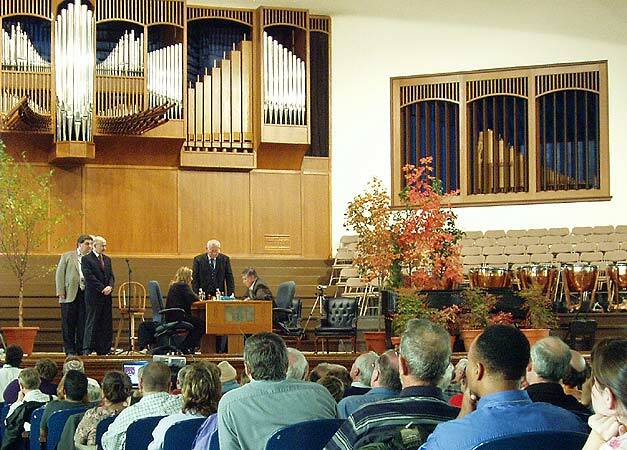 Chess Grandmasters Anatoly Karpov and Susan Polgar, and former Soviet President Mikhail Gorbachev greet an assembled crowd (and the Kansas wind) October 29 in Lindsborg, KS. The occasion was the kickoff of the Chess for Peace initiative, a project of The Karpov School of Chess in Lindsborg which seeks to "establish long-term relationships between the young people around the globe by using chess as the vehicle by which to promote mutual understanding of shared problems." 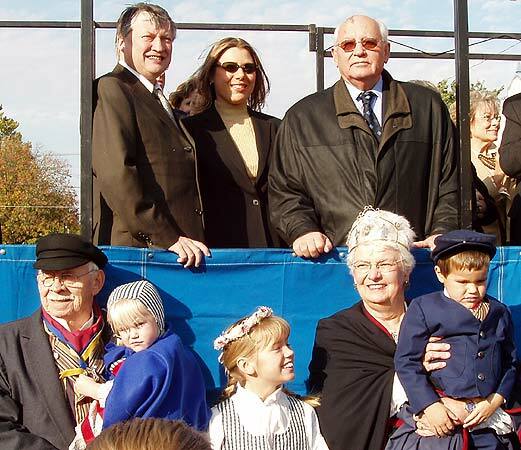 It being Lindsborg, the first family as elected at the recent Svensk Hyllninfest, posed with the dignitaries at the parade review stand. I also shot pics of the parade, but, having just run three posts on Lindsborg, I figured I'd better stick to the chess occasion this time. Karpov looks bemused...I wonder why? 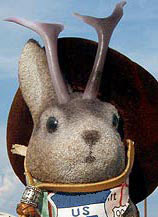 I also wonder if Gorby is phoning his security to ask what the deal is with the guy and the jackalope? 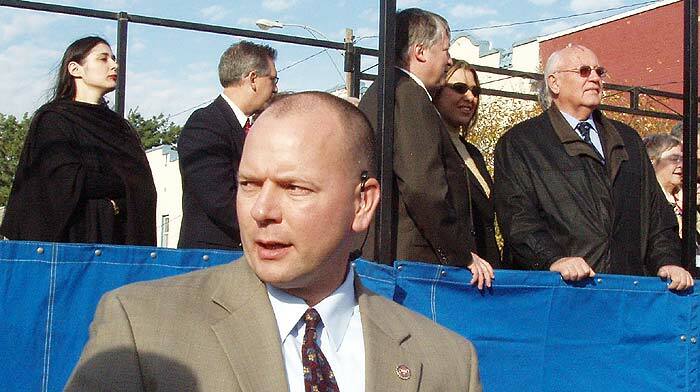 One of the most interesting aspects of the occasion was the sport of watching Russian and American security and law enforcement officials, such as this Kansas Bureau of Investigation agent. If I were casting actors to play agents in a movie, this guy is exactly the look I'd go for. 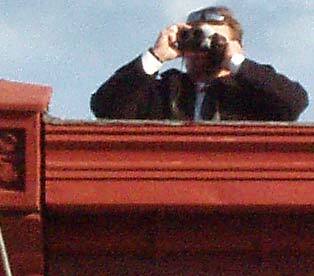 A KBI agent observes me from a roof top. There is no more beguiling a creature on Earth than an intelligent woman with a mission. 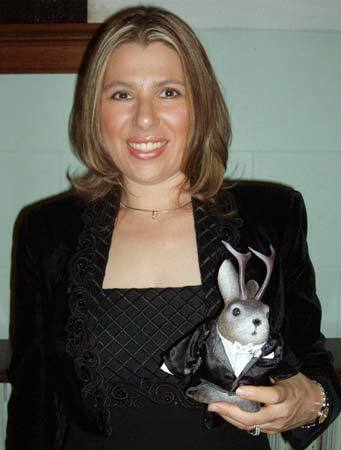 So, we were immediately attracted to Susan Polgar, winner of four Women’s World Chess Championships and ten Olympic Medals (five gold, four silver and one bronze). She is currently ranked #1 in the United States and #2 in the world. The website of her Susan Polgar Foundation states that "It's mission is to promote chess, with all its educational, social and competitive benefits throughout the United States, for young people of all ages, especially girls." You may well be asking: How does an international peace initiative come to be launched from Lindsborg, population 3,200? The genesis of this lies in Dr. Mikhail Korenman, Assistant Professor of Chemistry at Bethany College in Lindsborg. 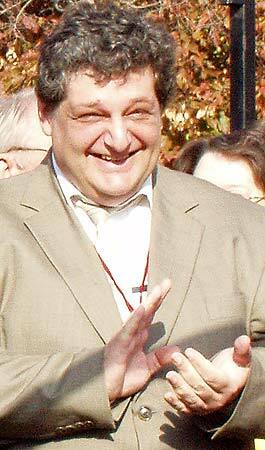 Korenman is a friend of Karpov, and convinced him to start the chess school in Lindsborg. 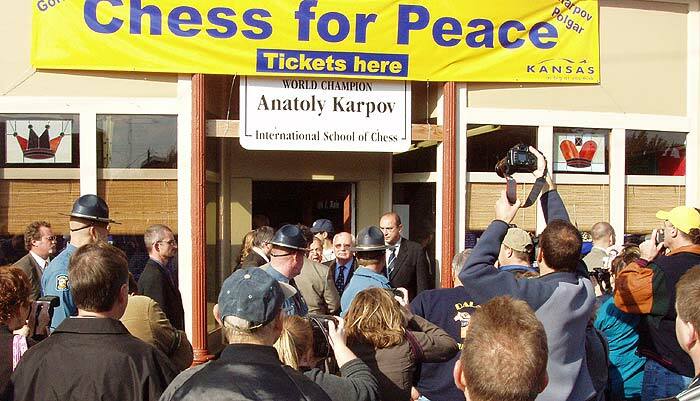 The Chess for Peace initiative was, in turn, born of Karpov's chess school. 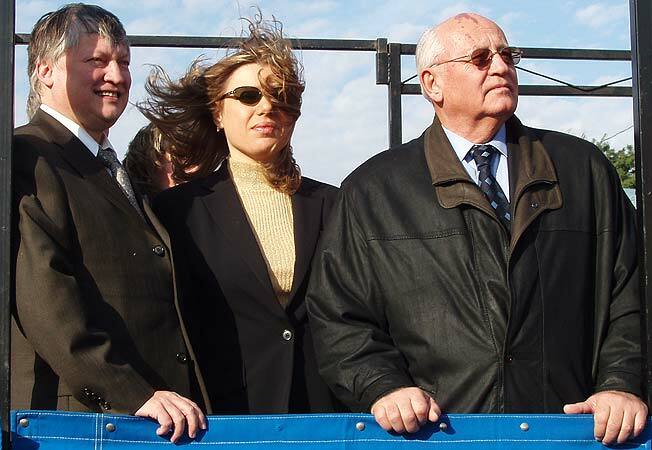 Here, Gorbachev emerges from a visit to the school amid a throng of press, security and onlookers. 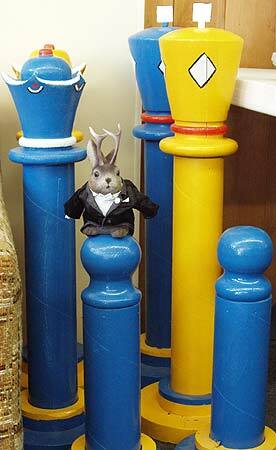 Ace hangs out on some giant chess pieces. Chess pieces or nesting dolls? Saturday also saw a scholastic tournament at Lindsborg's Bethany Collage. *click* *tap* *clack*...the sounds made by the movement of hundreds of chess pieces is a refreshing change from the dribble of a basketball. I really hope this increases in scope and popularity. "She's planning for the kill move" one of the spectators was heard to say of this little girl. 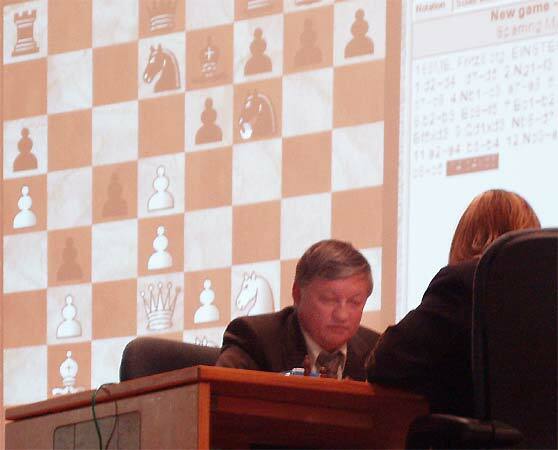 Saturday afternoon saw the second "Clash of the Titans" - a rematch between Karpov and Polgar held in Bethany Collage's Presser Auditorium. 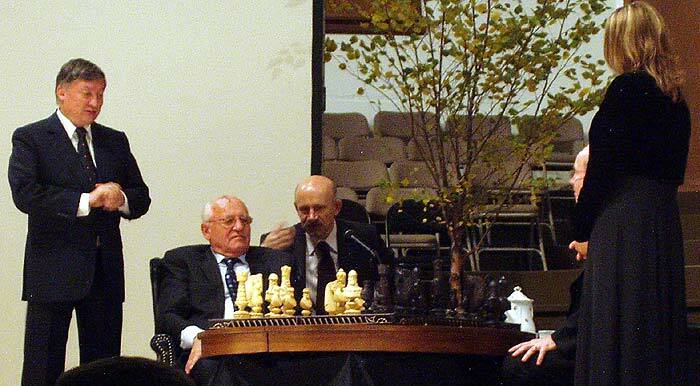 Here, Gorbachev observes the first game after having made the opening move for Karpov. An electronic board and projection system enabled the crowd to follow the game. It had a few glitches, but managed to do the job. 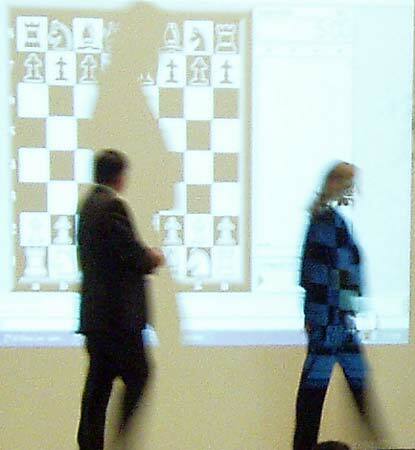 It also furnished me with a fun effect to use as Polgar and Karpov walk to their seats after a break. The match ended in a 3-3 tie. After each game, the players change sides. Pretty darn convenient for photographers, eh? 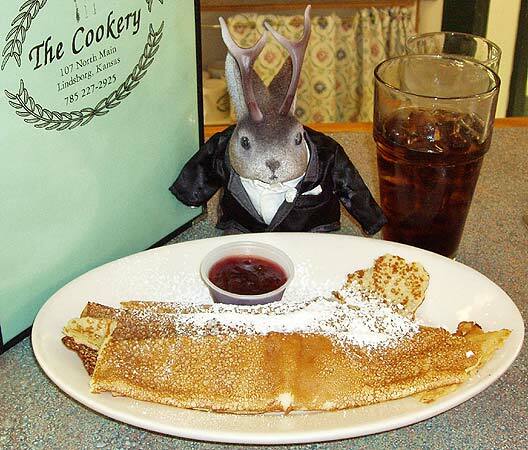 We'd heard of Sweedish pancakes, but never experienced them, so we headed to The Cookery to remedy that. They reminded me of crepes with lingonberry jelly...very tart and tasty. Back at Presser Auditorium, the evening's main event was an interview of Gorbachev by Wall Street Journal reporter Alan Murray. This was much more security than I'm sure Lindsborg had experienced before, and all bags had to be searched before entering. 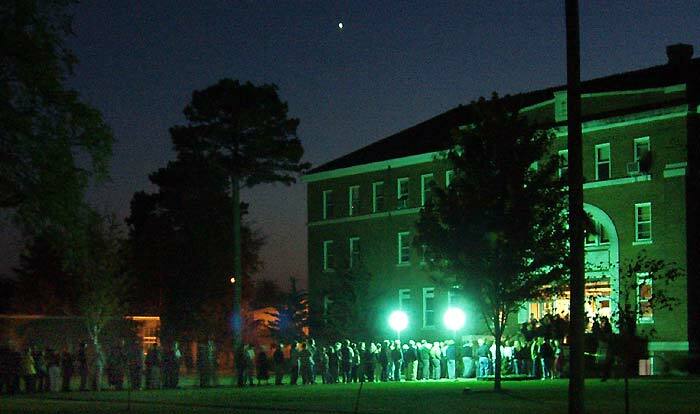 This is just the head end of the line; it stretched about a block and a half long but moved fairly quickly. Murray posed questions and Gorbachev replied through an interpreter. It was quite interesting to hear his views. "You know people speak about national interests or corporate interests...we have to give priority to global interests, because today you cannot solve your own security concerns. It is world security." Gorbachev said that, initially, late President Ronald Reagan impressed him as "a real dinosaur" and that Reagan told his staff that Gorbachev was "a diehard Boleshevik." He said he eventually found Reagan to be a compassionate man who shared his desire to reduce nuclear arms. On the subject of a current conflict, he remarked that "the credibility of the United States has suffered as a result of the war in Iraq." 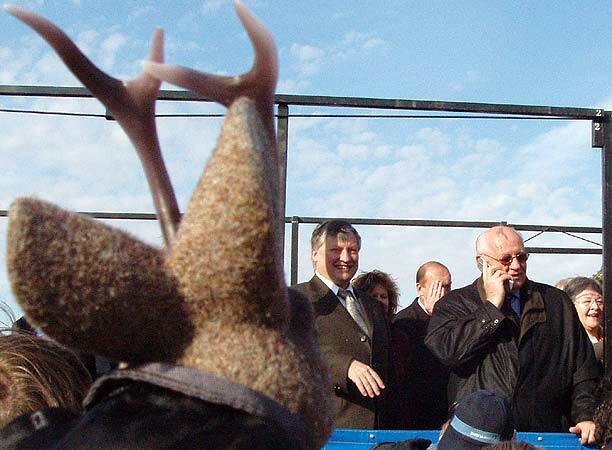 World peace is still a concern of Gorbachev. "I believe for those who live in the wealthiest countries, that if we don't pay attention to those living in poverty, then we are creating a tiny bomb that could explode." 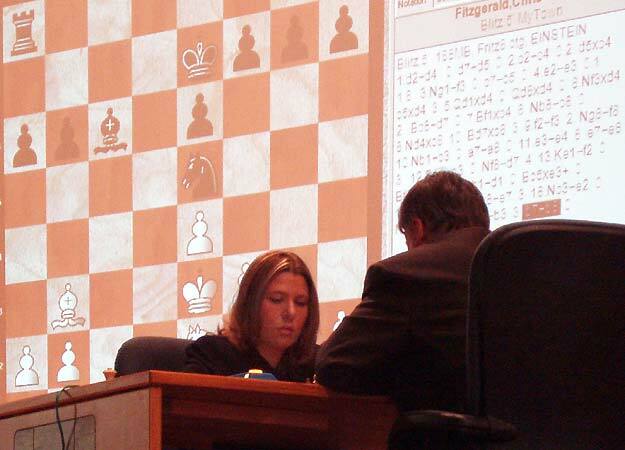 Karpov and Polgar emerged at the end of the interview. Judging from the comments of Karpov, the chess game was less than stellar, but it was intended only as an entertaining framework for the interview. The World Chess Federation, Inc (WCF) announced today that it will, due to a special agreement with sponsor International Capital Consulting, grant FREE ENTRY into the upcoming WCF World Chess Championship Qualifying Tournament (Reuben Fine Memorial) that will be held December 1-13 for all entrants who provide proof of reservation to stay at the event's host hotel. The offer of free entry to those making reservations at the Riviera is valid through October 31, 2009. Entry forms are at the Tournament registration page at www.americanchessassociation.org and reservation details are also available at the same site regarding the special $39 room rates being offered. Players have a chance to compete for free for $128,000 in prizes in stage 1, $1,280,000 in prizes in Stage 2 and a chance to qualify into play for a 6 million WCF title match. WCF expects this to possibly be the biggest chess tournament in history.